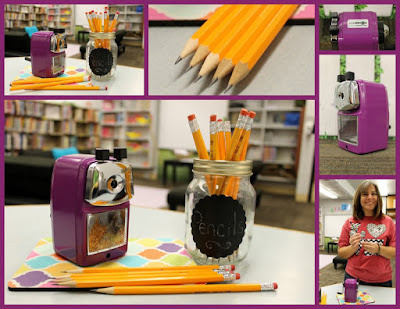 Lil Country Librarian: Classroom Friendly Supplies Best Pencil Sharpener Now Comes in Popular Purple! Classroom Friendly Supplies Best Pencil Sharpener Now Comes in Popular Purple! I was recently contacted by Classroom Friendly Supplies with the chance to review their newest color, Popular Purple! I jumped at the chance to do a blogger review! I first received the groovy green pencil sharpener when I was teaching Kindergarten a few years ago. I immediately took it to every teacher, administrator and custodian that would watch me demonstrate the magic of this fabulous pencil sharpener! The students were in awe and begged to get to sharpen pencils for the whole class. For too many years, we had pencils that wouldn't sharpen on all sides and it wasn't just the cheap pencil brands. The pencils would have wood over one edge of the lead and it made it so difficult for students to write. Who hasn't had this problem, right? This sharpener outperforms any wall mounted or electric pencil sharpener I have ever owned. It is relatively quiet, easy to use and lots of fun for students! I highly recommend it and now it comes in the most beautiful, vibrant Popular Purple! It matches my library perfectly this year with our Backyard Bash theme. If you've never tried this pencil sharpener, please head over to Classroom Friendly Supplies and buy one or three or enough for your whole school! You won't regret it! It also comes in colors like black, blue, green, pink and red. The only flaw for me in the design is that the piece that comes with it to attach it to a table or ledge, doesn't work well on the majority of the surfaces in our library and it ends up slipping off while sharpening. I have noticed that most of our table and counter edges are rounded though, so if you have a straight table edge, it might work better. *I was given a Popular Purple pencil sharpener by Classroom Friendly Supplies for my honest review of the product and to promote the new color, Popular Purple. The opinions given are 100% mine. It has been months since he left his Preschool and my son is still asking to go to school, and telling stories of things that he's done with his Phoenix pre-k teacher. He constantly asks to see her.